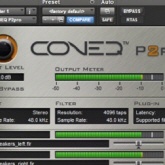 CONEQ is the most accurate and detailed loudspeaker measurement and equalization technology. 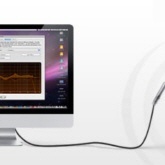 CONEQ measures the Acoustic Power Frequency Response (APFR) of your loudspeakers. When the CONEQ correction is applied to your loudspeakers, they will produce a much more linear sound throughout their coverage area. 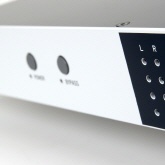 CONEQ is the only technology that is based on Acoustic Power (Sound Power) measurements. The Acoustic Power by definition is the entire Acoustical Energy that any device or loudspeaker emits. Unlike traditional Sound Pressure Level (SPL) measurements, measuring of Acoustic Power implies gathering of a multitude of up to 300 measurement points though the loudspeaker coverage area and obtaining of a true Acoustic Power Frequency Response of the loudspeaker in it´s installation environment. Acoustic Power measurement is a measurement of energy. A SPL (Sound Pressure Level) measurement is a measurement of the sound pressure level at a single point in space. No electro acoustical device emits its energy from or into a single point in space. A general problem with the SPL measurement is the fact that any SPL measurement will always evaluate a major amount of interferences at the pint in space where the measurement is taken. This will happen in any room but an anechoic chamber, caused by the reflections of the sound waves within any room. The human hearing system however is not sensitive to the interferences in a single point in space. It is commonly understood an accepted in acoustical measurements that the human hearing system determines the sound quality of any sound system on an energetic level. In that regards a correction of the Acoustic Power resembles the way we hear much closer that anything else available. CONEQ synthesizes a high resolution FIR (Finite Impulse Response) Filter curve. This curve is applied in the digital domain to the audio signal. No passive components are used to develop the filter curve and therefore none of the inherent problems with passive filter designs are added to the audio signal.